Is there any possibility that the power consumption is greater than power supply on ISS? What happens (or potentially would happen) if we plug too many electric devices so that ISS couldn't handle it? I believe that there is an emergency system which powers life control system when fuses are blown. Would astronauts then have to replace the fuses? If yes, how much time do they have for that? This answer addresses only the US side of the ISS. Like everything else on the ISS, it's complicated. Fuses are not commonly used on the ISS. There are fuses within the battery subassemblies, to protect against internal battery shorts. The common circuit protection device on the ISS is the Remote Power Controller (RPC), a commandable "smart circuit breaker". An RPC monitors the current passing through it and opens the circuit if the current exceeds a limit for a specified amount of time. The RPC can be commanded to reset once the problem has been resolved. The RPCs are grouped into RPC Modules (RPCMs). If the input voltage to an RPCM drops too low, all the RPCs in the RPCM will open. If the power usage gets higher than the supplied power can handle (for example, if a solar array is lost), the onboard computers (MDMs) can command a 'load shed'. 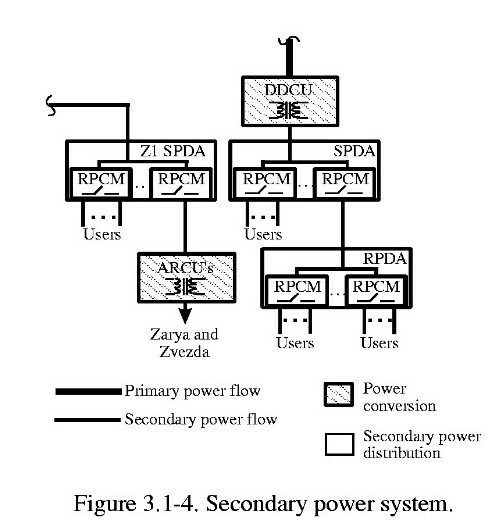 Using tables preloaded into the software, the MDM(s) controlling the electrical power system will command the RPCs on a set of devices open, powering them off. If the power loss event is predicted, the flight controllers can most likely do a better job of powering down the station based on the current configuration than the load shed tables would. They would send commands to open the desired RPCs. I believe that there is an emergency system which powers life control system when fuses are blown. As stated, fuses are not commonly used, and there is no such emergency system. 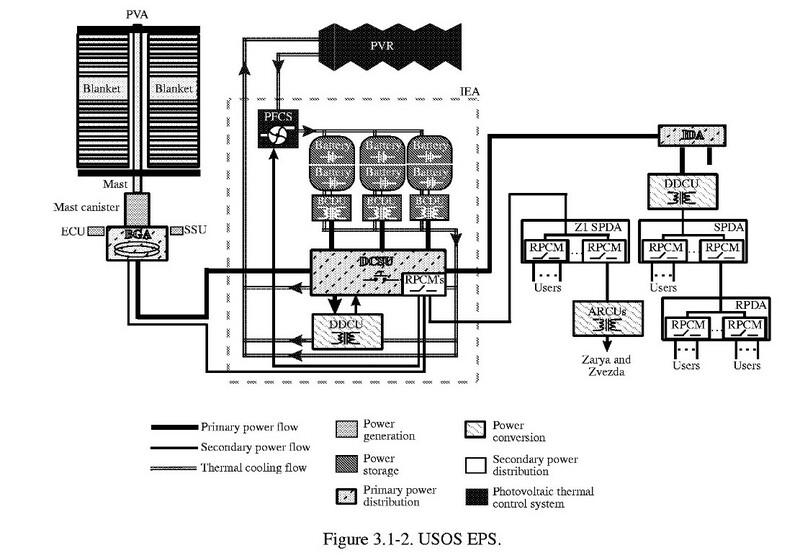 The ISS already runs off battery power when the solar arrays are not generating power. The load shed tables are built so that critical functions are the last to be turned off. Source - personal notes. NASA does not provide a good reference source for the ISS. There is some information in this paper, from which the images are taken. Not the answer you're looking for? Browse other questions tagged iss power electronics or ask your own question. How would a centrifuge module's berthing system work on the ISS? If electronics are magnetic, how do they work in space?